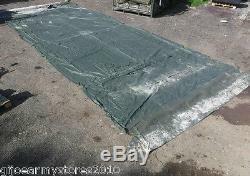 British Army 18x24 Syntex Roof & Wall Section. Direct from the British MOD. One time offer price - When they are gone at this price, they are gone! Grade 1 - With little or no use (these appear to have been used once or twice). Listing is for one Roof & Wall canvas section, as shown in the photos. Latest & current issue SYNTEX material (VERY waterproof & heavy duty). Approximately 4.1 meters x 10.6 meters, at widest / longest points. 3 Part windows each end (mesh netting, clear pvc, & green blackout canvas). 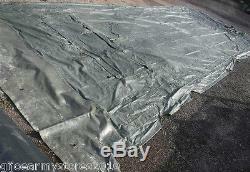 With the windows done up, this can be used as a complete waterproof sheet if preferred! Ideal for a replacement or a spare. The item dispatched will be similar to the one shown in the photos. Viewing & Collection is welcome with prior arrangement. 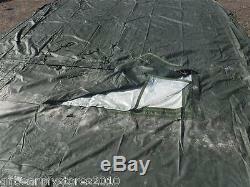 The item "Military Army 18x24 Tent Roof & Wall Section Syntex Canvas Sheet 4x10.6m MOD G1" is in sale since Friday, September 23, 2016. This item is in the category "Collectables\Militaria\Surplus/ Equipment\Other Surplus/ Equipment". The seller is "gijoearmystores2010" and is located in Warehouse Site, South Witham. This item can be shipped to United Kingdom, Austria, Belgium, Bulgaria, Croatia, Cyprus, Czech republic, Denmark, Estonia, Finland, France, Germany, Greece, Hungary, Ireland, Italy, Latvia, Lithuania, Luxembourg, Malta, Netherlands, Poland, Portugal, Romania, Slovakia, Slovenia, Spain, Sweden, Australia, United States, Canada, Japan, New Zealand, Israel, Hong Kong, Norway, Indonesia, Malaysia, Mexico, Singapore, South Korea, Switzerland, Taiwan, Thailand.